Swing pipe tee by tempo - barb size : 1/2"
Use swing pipe tees when you need to split your 1/2" swing (funny) pipe run in three directions. Swing pipe fittings are used with high pressure 'swing' or 'funny' pipe commonly used in lawn sprinkler systems. 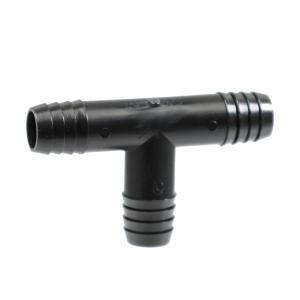 Manufactured of hard Acetal plastic for durability, these fittings are designed with easy "Twist In" one way barbs for no leak, no blowout confidence. No glue or clamps required. Maximum operating pressure is 80 PSI.